Rotate to select Speed Dial, then press . Rotate to select Add New, then press . Rotate to select a place to choose a number from, then press . 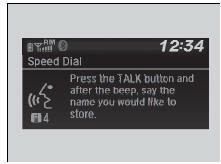 When the speed dial is successfully stored, you are asked to create a voice tag for the number. Rotate to select Yes or No, then press . 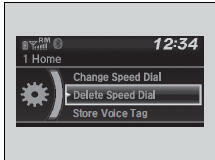 Using the button, follow the prompts to say the name for the speed dial entry. Press and hold the desired audio preset button during a call. The contact information for the active call will be stored for the corresponding speed dial. 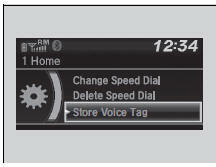 When a voice tag is stored, you can press the button and call the number using voice commands. Rotate to select Change Speed Dial, then press . Select a new speed dial number, then press . Rotate to select Store Voice Tag, then press . Using the button, follow the prompts to complete the voice tag. Rotate to select Change Voice Tag, then press . It is easier for HFL to recognize a longer name. For Change Speed Dial example, use "John Smith" instead of "John." Rotate to select Delete Voice Tag, then press . Rotate to select Delete Speed Dial, then press .